This 36ft Monteray was purchased by some guys that originally started as customers then turned into great friends. We’ve done a lot of cars together and they contacted me about a new project. This is their new pride and joy and they wanted it to look it’s absolute best and stay that way for as long as they own it. 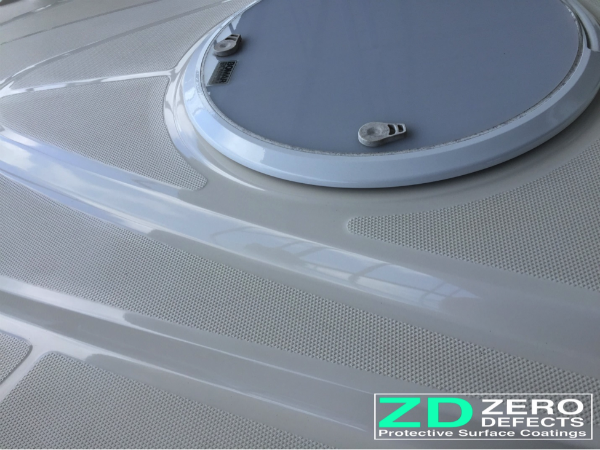 The boat was purchased out of state and there was a lot of planning and a lot less time involved to get this project done. We had to coordinate on a location to fit this huge thing and also work around the stereo guys that were installing a huge sound system and custom LED lighting. 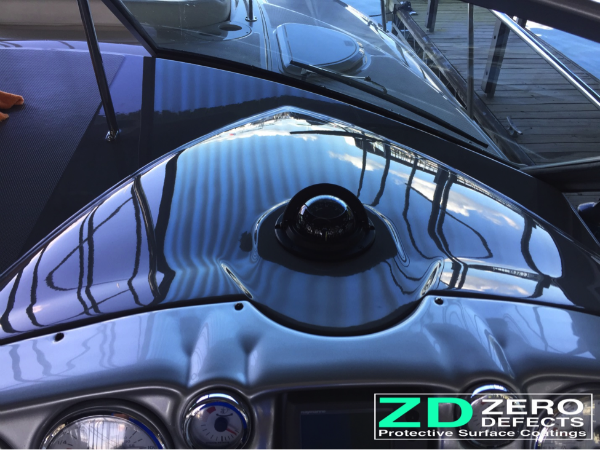 We had previously installed a Nano ceramic coating on a few of the customers sports cars and they were so pleased with the performance of the coating that they were interested in having their new boat protected with a nano coating as well. 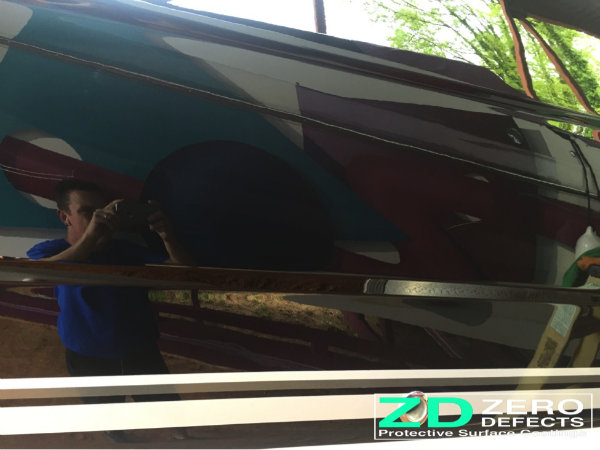 This was the first time I had ever installed a coating on a boat and anything of this size. 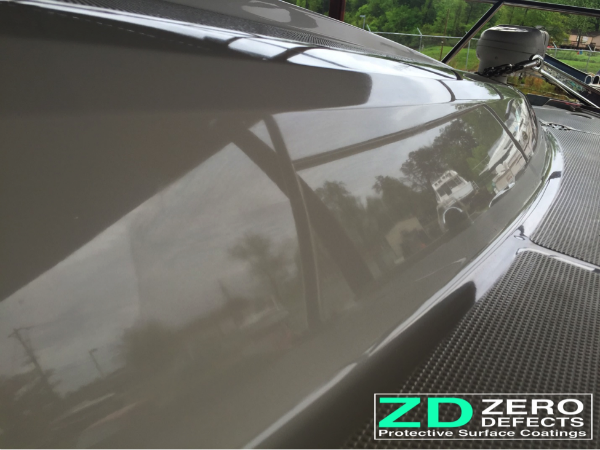 This boat took a lot of time, product, polishing, and money to perfect. When we were done it was nothing short of amazing. 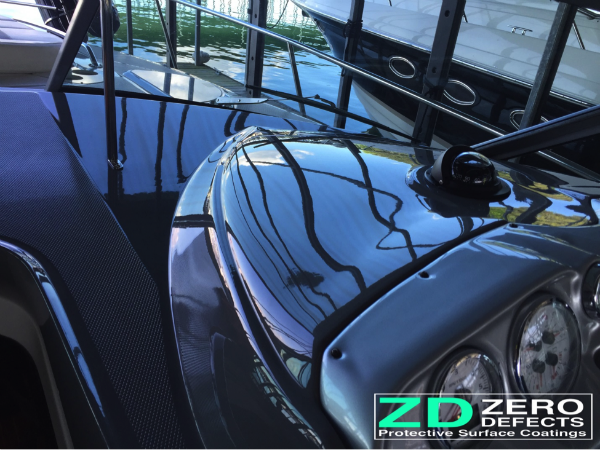 The performance of a nano ceramic coating applied to a boat cannot be matched hands down to anything else on the market. 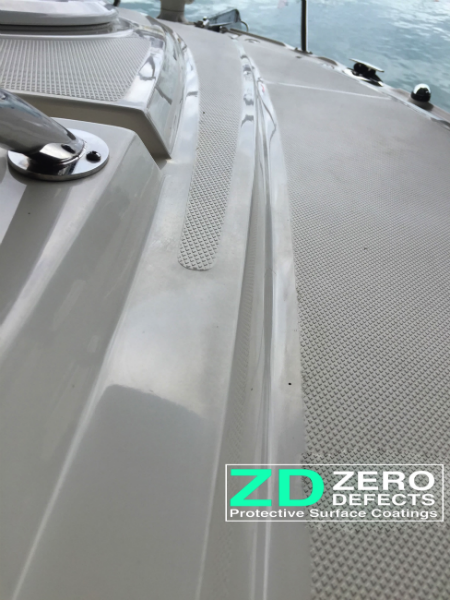 The protection the coating can provide to a marine application is simply amazing and will soon become the ultimate product in the marine industry soon. I was simply blown away by the effect the nano coating had on the gel coat. 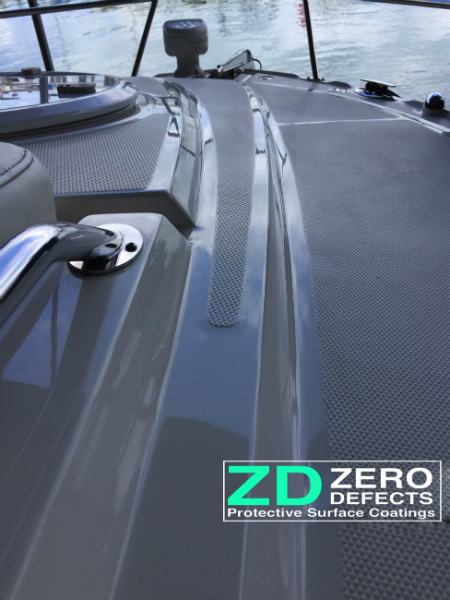 I had no idea going into this project the incredible protective effect this product has on marine applications. 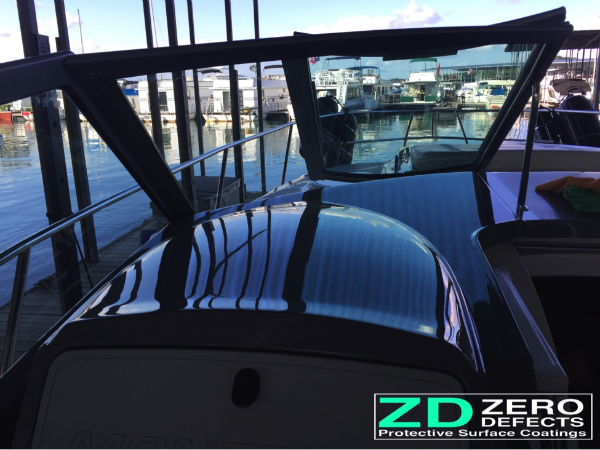 First the entire boat needed to be polished. This was extremely time consuming and was not easy being on a ladder for 3 straight hrs per side. 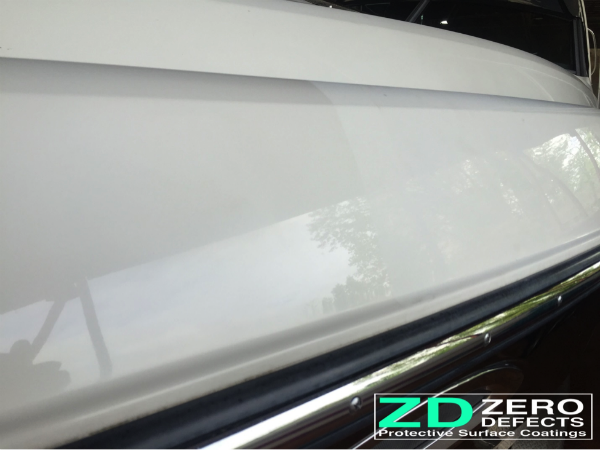 The gel coat was in very good condition and needed to be lightly polished to bring back that brand new shine. Here you can clearly see the difference from the left to right. All of the stainless was polished and protected as well. The stainless was dull and faded from not being protected previously. 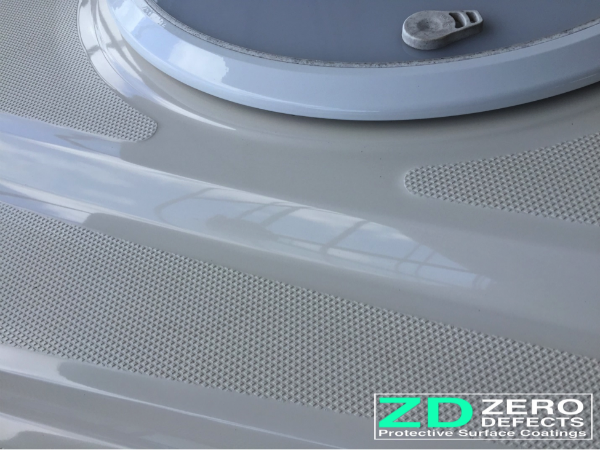 After the polishing was finished it was then coated with a specially formulated metal & glass coating to protect it for years to come. 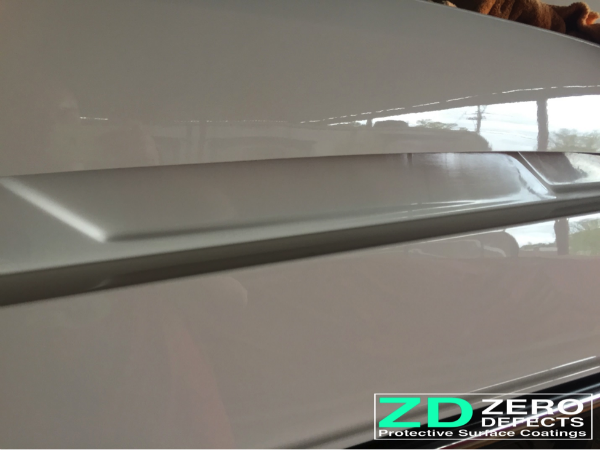 Nice 50/50 of the painted gel coat after polishing was performed. You can clearly see the depth of the color being brought back. 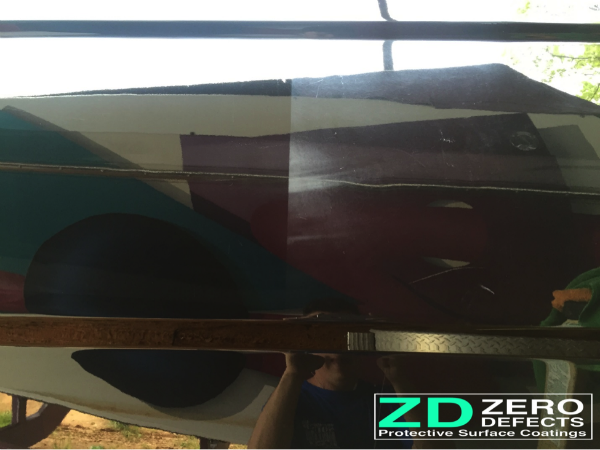 Gel coat is one of the quickest surfaces to deteriorate. 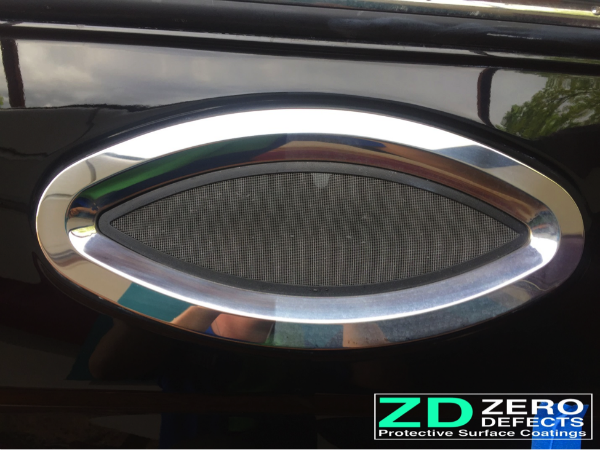 These 2 pictures you can really see the gloss and reflections coming back after the polishing and coating were performed. 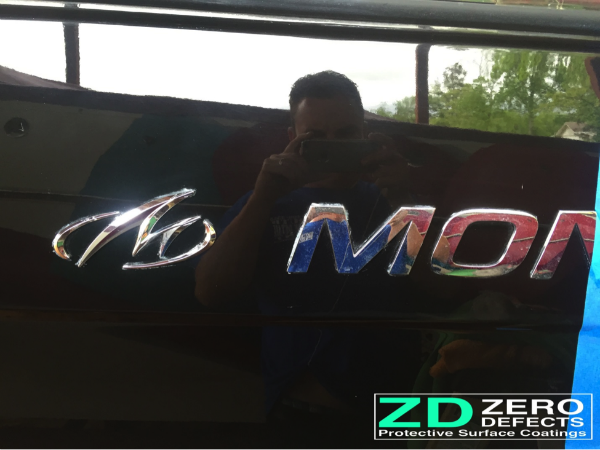 The lettering on the side of the boat was fully restored and protected as well. 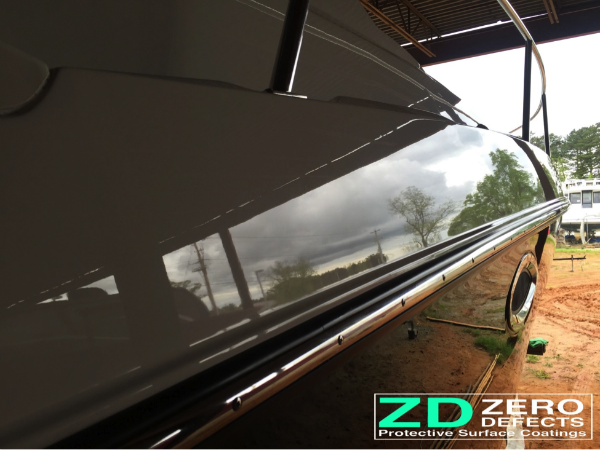 The nano coating provided an insane amount of gloss on the gel-coat. Havent seen anything like this before on a boat. The reflections were like a mirror. Even on the non painted surfaces of the gel coat the nano coating made it just super flossy!! 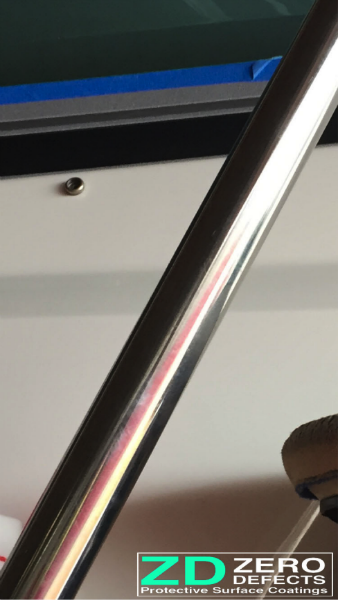 All of the railing was polished and coated as well. 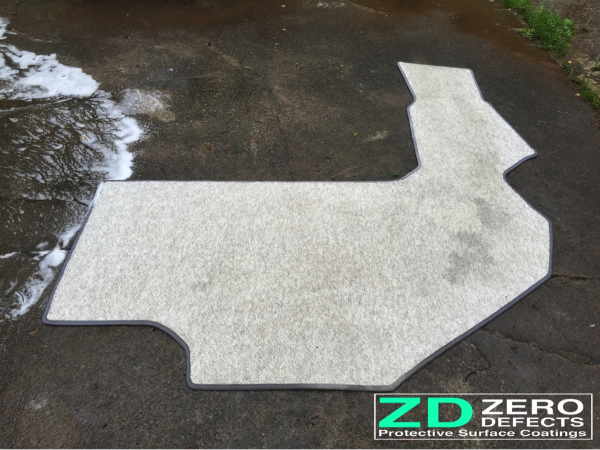 Carpets were removed to be shampooed then later after they dried they were treated with a fabric coating to be stain repellent. 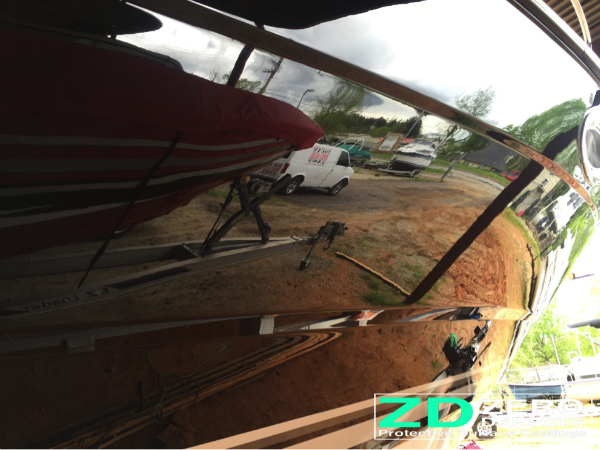 All windows were polished to remove water spots. 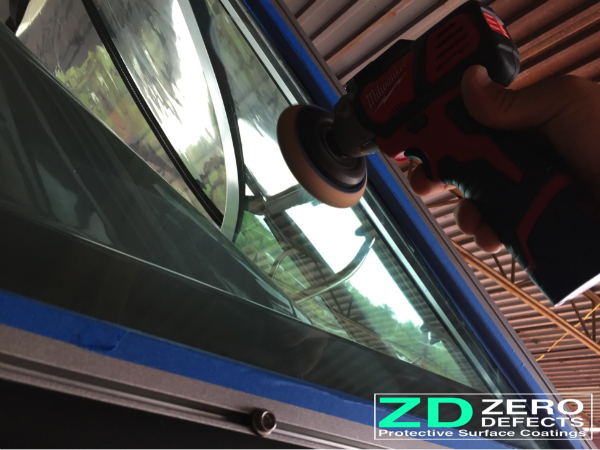 Then they were treated with a super durable window coating. 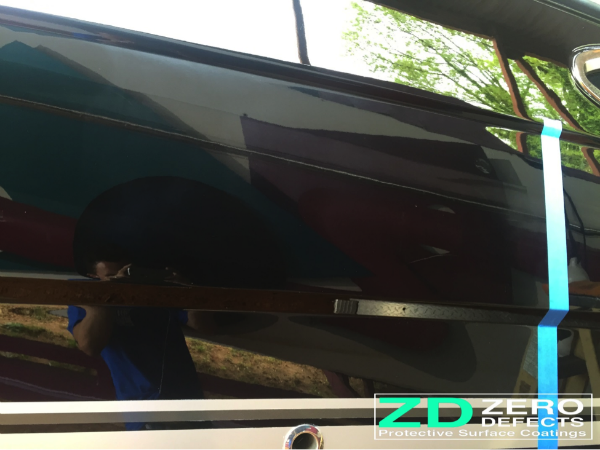 Here is some gel coat that had been polished when I did the original install that did not get coated. You can see that just in 2 months it had already started to fade and oxidize. 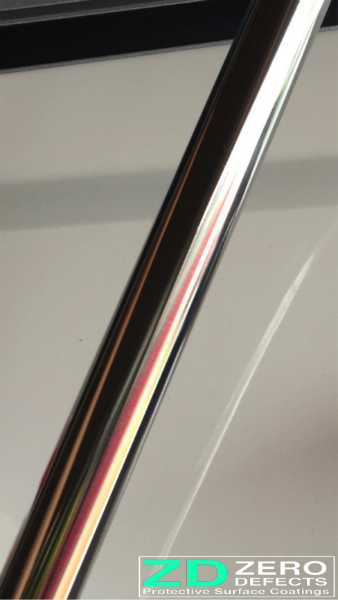 Here is the same section that I polished and coated with the Nano coating. 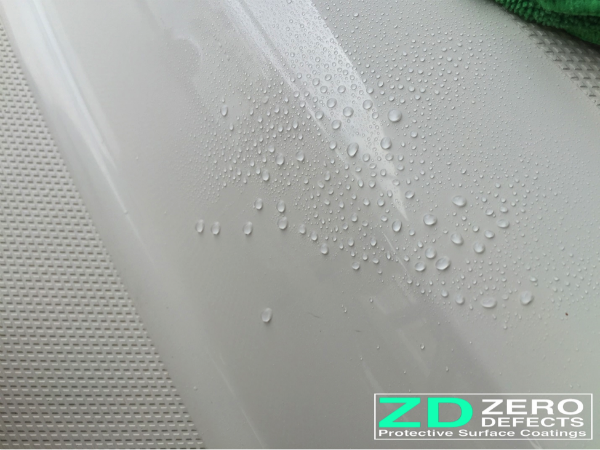 In these 2 photos you can clearly see the difference in the way the water reacts to the Nano coating. 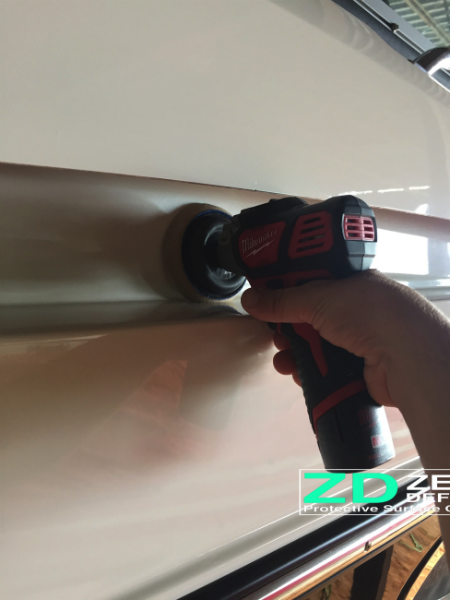 It changes the surface of the gel coat to a non-porous surface. 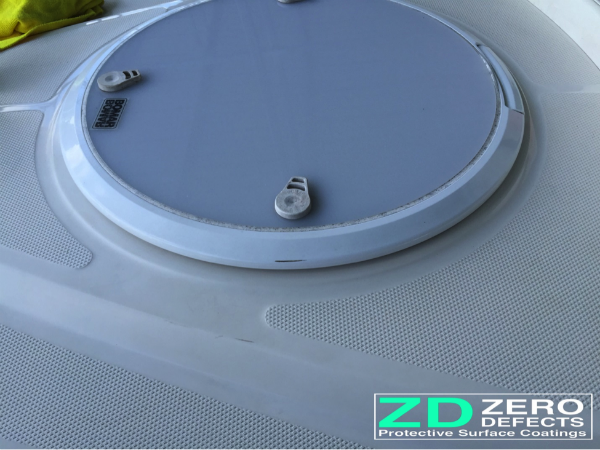 This helps the water repel from your boat keeping it cleaner longer & also making it easier to clean. 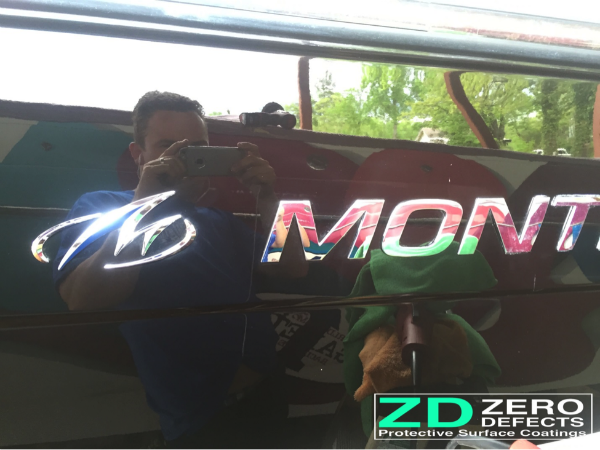 These 3 pictures clearly show the insane amount of gloss that the Nano coating provides. Here’s the happy customer out enjoying his beloved pride and joy. This is one of the hottest boats on the lake and it will stay looking this good for years to come. 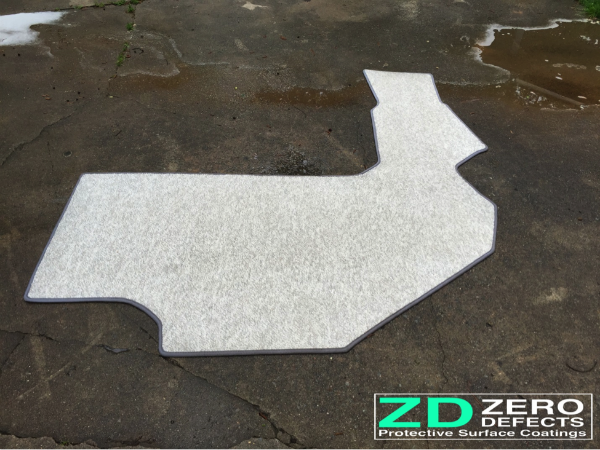 The Nano coating made a unimaginable difference to this beauty. What’s so great about this product is how long the protection lasts. You can expect years not months out of this product. 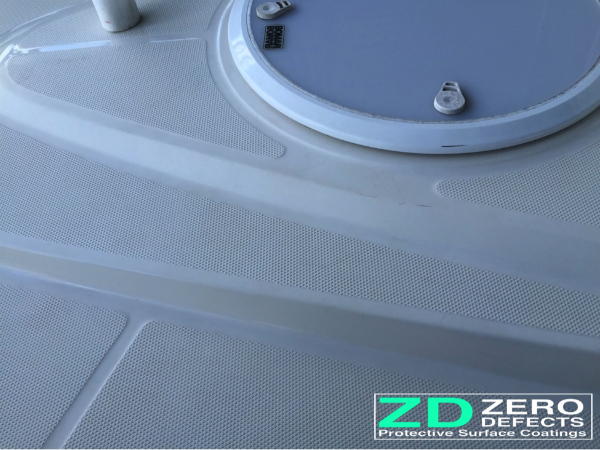 If you are serious about your marine vessel than this is the product for you.